Everybody body has heard the term “trainer”. It is a very ambiguous term. Some people use it for the big buff guy who makes you do 100 crunches at the end of your workout. Some people use it for a person leading a training. And then there is the “trainer” who we see on tv taking care of the big time athletes. I want to talk specifically about this “trainer”. These educated and highly skilled medical professionals are actually called Athletic Trainers. 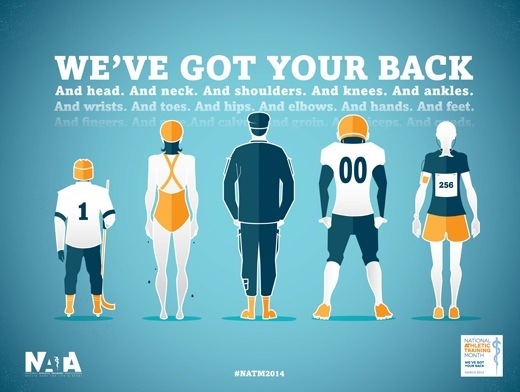 An athletic trainer is a medical professional who collaborates with a physician to provide care to patients. These services include evaluation, treatment, rehabilitation and emergency acute care. Athletic trainers are also not only in athletics. Athletic trainers can be found in clinics, both rehabilitation and physicians offices. Athletic trainers are also utilized in the performance arts (cirque du soleil), military, and industrial settings. As said before there are so many different fields to the athletic training profession, but I will speak on what I know best, the more traditional field of athletic training which is athletics. Every professional team and college athletic program has 1 or multiple athletic trainers providing medical care to their athletes. Where the coverage is lacking but has increased is at the high school level of athletics. Many school districts and even state school boards are beginning to require an athletic trainer at home athletic events. Where the coverage is lacking is in the less affluent areas, such as rural and some inner city areas. This is a shame as these athletes deserve the same amount of medical care as the rich kids. Many deaths in athletes at the high school level could’ve been avoided had an athletic trainer been on site to provide emergency care. The single most important job of the athletic trainer is preventing/treating an emergency situation. Athletic trainers have been trained to handle life-threatening events such as asthma, cardiac events, and head and neck injuries. We have been drilled over and over on these situations and are prepared to act when needed. This is the primary reason parents should be beating down school board doors if their school does not have an athletic trainer at the school for sport activities. I have heard the quote, “if you can’t afford an athletic trainer, you can’t afford to have football”. I think this is a very true quote, but I would even extend this into the entire athletic department. Athletic Trainers are all also skilled in the realm of exercise and movement. This could include everything from strength and conditioning, rehabilitation, movement assessment. This particular area has become a huge area of interest for me. This is the “fun” part as it takes a bit of problem solving to treat an orthopedic injury or a movement dysfunction. Athletic trainers, under the direction of a physician, can take an injured person from day 1 of the injury and safely return them to play through rehabilitation and treatment. For me, this may be the most satisfying aspect of my job, to see that athlete go from devastated because an injury has ended his/her season and be back at their top level of physical shape playing like they were never hurt. It is one of the big reasons I am excited to walk in to work each day. This is what sets us apart from the “trainer”. Athletic trainers are saving lives and allowing for a better quality of life for athletes as well as the “retired athlete”. I am proud to be called an athletic trainer because I know I am helping people do what they enjoy safely.